With the recent rainy and hot weather, certain tree diseases are gearing up to attack our landscape. 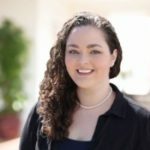 In particular, fungal diseases thrive on our current rainy and warm conditions. 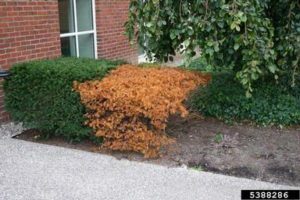 When fungal spores are activated and come in contact with a susceptible host they begin to grow, enter, and feed on the tree or shrub causing major issues. Below are the 5 fungal diseases you need to watch out for after rainy periods. Phytophthora Root Rot is an extremely damaging and widespread fungus-like organism that will rot away root systems and eventually kill your tree if left untreated. In the worst cases, when left untreated trees can become structurally unsafe and uproot or snap possibly causing property damage and injury. Leaf spot is a term that encompasses a group of different plant diseases that attack the foliage of a tree creating leaf spots. 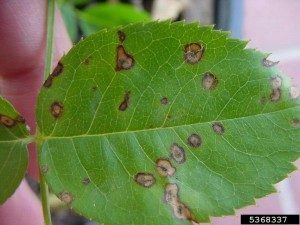 One of the most common leaf spot diseases is Anthracnose, although this fungus tends to prefer the cool weather of spring. Other leaf spots, like Cercospora, thrive in warm wet conditions so you will see an increase in infections the weeks after this rain storm. Leaf spot will start as a small spot on the leaves. 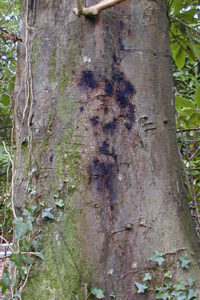 As the disease progresses more spots appear until the leaf ceases to function as the site of the tree’s food production process and falls off of the tree. Cankers diseases are a general term used to describe numerous fungi that create tree cankers when they infect trees. Typically these fungi will enter the tree through external wounds caused by lawnmowers, chemicals, environmental conditions, or insects. Once the fungus enters the tree it grows just underneath the bark causing cankers. Common canker diseases include; Cytospora, Hypoxylon, Phytophthora Bleeding Canker, and Nectria. 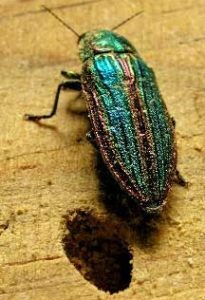 Cankers diseases make trees highly susceptible to tree borers. As the canker weakens and stresses the tree it leaves it vulnerable to secondary invaders, specifically borers. These borers are attracted to the weakened condition of the tree and quickly move in to feed. Oval, brown /reddish, sunken lesions on the trunk of the tree. Splitting bark that may ooze sap or moisture. Targets: Beech, Maple, Oak, Spruce, Cherry, Birch, Willow, Honeylocust, Mountain Ash, Elm, Sycamore, and Hickory. Powdery Mildew is one of the most common and widespread plant diseases. Powdery Mildew coats the trees leaves blocking the process of photosynthesis which turns light into food for trees and shrubs. Every year trees and shrubs rely on their food reserves to push out new leaf growth. These newly produced leaves must then replenish the food supply through photosynthesis. When this process is interrupted by powdery mildew the food reserves aren’t replenished and the tree/shrub’s growth will be stunted which can affect overall health. The stress caused by Powdery Mildew will also make the tree more susceptible to other diseases and insect infestations. 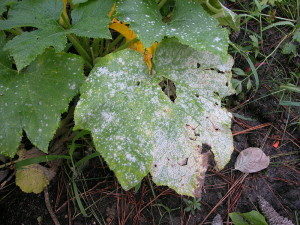 Powdery mildew is characterized by spots or patches of white to grayish, talcum-powder like growth. The fungus is most commonly observed on the upper side of leaves but it can affect the bottom sides of leaves, young stems, buds, flowers, and young fruit. Lilacs, Peonies, Dogwoods, and Crape Myrtles are especially susceptible to this area. Although, this is an insect, not a tree disease our Arborists want to warn homeowners about how the rain will affect the mosquito population. According to the University of Minnesota, we can expect an increase in the mosquito population after rainy periods. Mosquitoes love to breed in wet, shady areas which have bene plentiful this summer. With increased mosquitoes comes an increased risk of West Nile Virus, Zika, and Encephalitis. 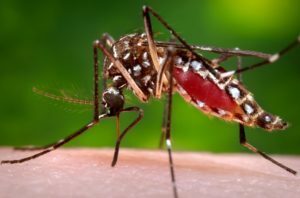 Make sure to take precautions to limit mosquito bites. If you have trouble with mosquitoes on your property we suggest follow the DIY tips below and investing in our natural mosquito control (an alternative to the heavy chemicals used by mosquito companies). Put a thin layer of vegetable oil on water you cannot drain (such as rain buckets or birdbaths). This suffocated the larvae and stops mosquito breeding. 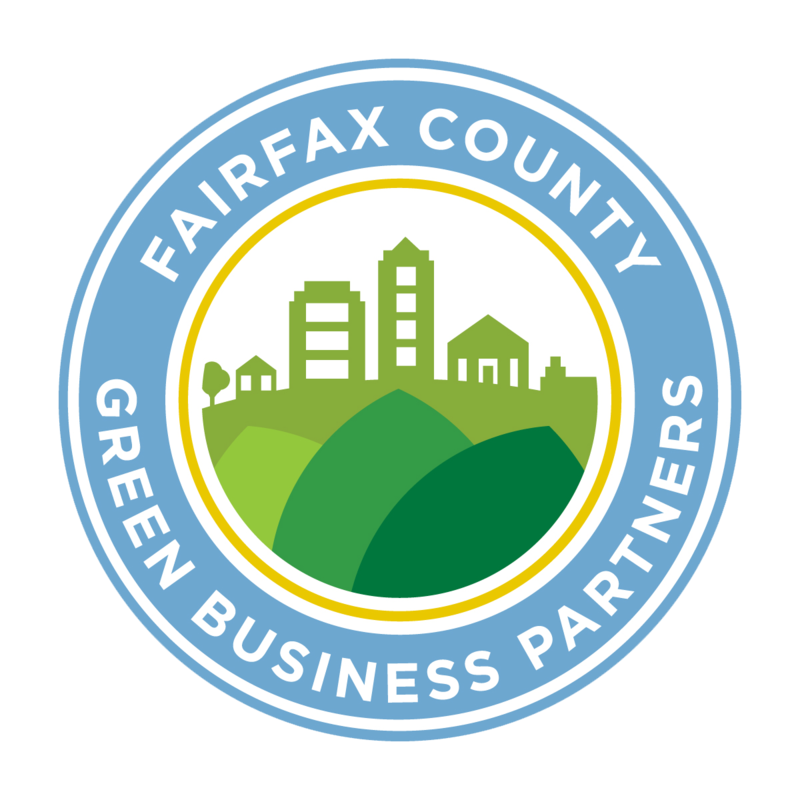 If you see any signs of these fungal diseases, give us a call at 703.573.3029 or book an appointment online. Our arborists will be able to diagnose the fungus affecting your landscape and create a treatment plan.